You want to see the world’s most well-practiced and ridiculous eye roll? Play me a sappy country music song. I see right through that charade – disingenuous, insipid and frankly offensive. To me, there are two kinds of emotional appeals in advertising and media. First, the kind I’ve just mentioned — intended to make you cry. I imagine the room of country music executives in sharkskin suits and cowboy hats (stay true to those roots!) in some Nashville high rise, sitting around a rich mahogany table coming up with the next sappy ballad. It’s sole purpose is tears. And the reason they do it? It works. It works really well. It’s why Christmas Shoes became a made-for-tv movie. But to me, I feel exploited. Toyed with. I lose trust in brands who take advantage of my tender heart. The second is a different kind of emotional appeal. It’s the kind grounded in truth – in real caring. I don’t feel exploited, I just feel touched. 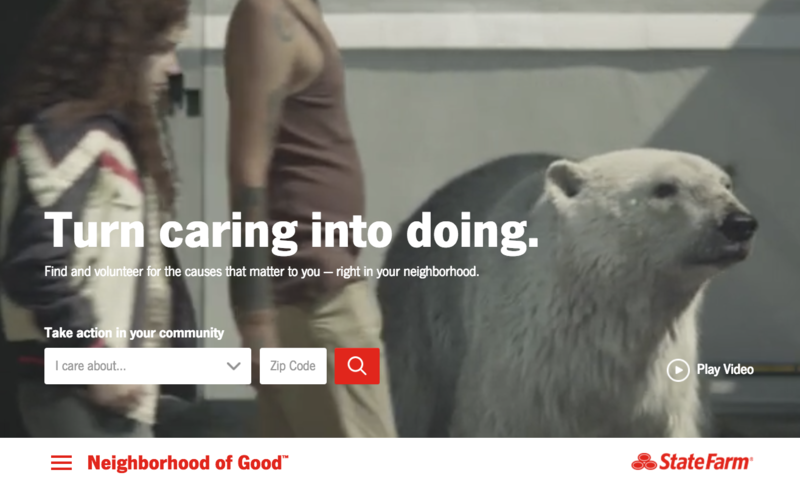 I experienced this recently with State Farm’s ad for its Neighborhood of Good service, which helps match you with local volunteer opportunities. A compassionate guy carries the weight of the world on his shoulders: at-risk youth, dog in need of love, polar bear in need of ice. Veterans. Homelessness. Poverty. Heavy. Weight. Adding. Up. Perhaps this is still that emotional appeal just hiding itself better, sneakier than the first. Maybe they are still exploiting my emotions in a different way, but somehow it works better for me. And the reason is its genuineness. A simple message. An emotional appeal. Done well. In return, State Farm becomes a trusted brand, honing in on their hyper-localized agents, and better yet — some neighborhood good gets done.